A Democratic Donnybrook in the Old Dominion? With the Virginia primary less than a week away, the eyes of the political world are now focused on the Old Dominion. Considering the early polling in New Jersey's gubernatorial general election contest, where Phil Murphy (D) starts as the favorite over Lt. Gov. Kim Guadagno (R) after both won their respective party nominations on Tuesday (more on that below), it seems likely that Virginia's race will be the marquee election of 2017, though the June 20 House special election in GA-6 might have a case. Here's what to look for in the Virginia primary on Tuesday, June 13. The Democratic gubernatorial primary contest between Lt. Gov. Ralph Northam and ex-Rep. Tom Perriello will undoubtedly get top billing on June 13. This matchup has prompted comparisons to the Hillary Clinton-Bernie Sanders clash in the 2016 Democratic presidential primary, but many observers (including the Crystal Ball) have taken issue with elements of that analogy. Still, the insurgent-establishment contrast works: Virginia Democratic leaders wanted Northam to have the primary period to raise money and prepare for the general election, but Perriello's candidacy upset those plans. Now Northam has had to spend $4.4 million since the start of 2017, money he would rather have had for the general (Perriello has spent $3.4 million). Meanwhile, Sanders himself has endorsed Perriello, and now Sen. Elizabeth Warren (D-MA), a leading liberal, is featured in one 1 of Perriello's closing ads. However, the involvement of Sanders and Warren shouldn't obscure the placement of former President Barack Obama in many of Perriello's campaign ads, particularly images from a 2010 rally 2 when Obama visited Charlottesville to campaign on the then-congressman's behalf. That speaks to the contest's national-state divide within the Democratic Party. Northam has the support of Gov. Terry McAuliffe, state Attorney General Mark Herring, and five of the state's six Democratic members of Congress (both senators and three representatives, save only Rep. Gerry Connolly, who has remained neutral). All 53 Democratic members of the General Assembly have endorsed Northam. Without much backing from state Democratic leaders, Perriello has instead secured support from major out-of-state national figures such as Sanders and Warren, and also numerous players in Obama's orbit 3. The candidates and their campaigns also reflect this national-state dichotomy. Perriello has served exclusively in national roles as a one-term member of the U.S. House of Representatives and as a State Department diplomat. In between, he headed the advocacy arm of the liberal Center for American Progress. His campaign roared out of the gates with a strongly anti-President Donald Trump message, whose election victory Perriello cited as the catalyst for his unanticipated gubernatorial candidacy. Meanwhile, Northam has nearly a decade of experience in Virginia government as a state senator and lieutenant governor. Northam is from the rural Eastern Shore, went to the Virginia Military Institute, served as a military doctor, and has a folksy demeanor. In most ways, he fits the more traditional mold of a Democratic statewide candidate in Virginia, bringing to mind elements of Old Dominion Democrats such as former Sen. Chuck Robb or even ex-Gov. Doug Wilder. While Northam has been critical of Trump, even calling the president 4 a “narcissistic maniac” in an advertisement, the lieutenant governor has had to play catchup to some extent in attacking Trump. It is fair to say, however, that both Democratic candidates have established they are firmly opposed to the GOP president and his policies. The two candidates' policy goals are fairly similar, though Perriello has come out against a controversial set of gas pipeline projects in western and central Virginia, putting Northam in a bind because McAuliffe supports the projects. But the two candidates' styles and campaign approaches reveal differences. Both candidates have made sure to mention their opposition to Trump in their ads, but Perriello is trying to break through via a campaign focused more on economic populism and his connections to Obama, while Northam has highlighted his consistent support for traditional Democratic social issue positions, such as gun control, abortion rights, and gay marriage. Perriello's record in Congress has opened him up to criticism regarding gun control and abortion, and Northam has earned the backing of gay rights groups, abortion rights organizations, and gun control advocates. Interestingly, Northam's first TV spot 5 included his early support for marriage equality, which appears to be the first statewide campaign ad to do so in Virginia history. Depending on the poll, the race is either about even or Northam is ahead. The public polls have routinely shown a close contest, with the most recent one from the Washington Post finding Perriello ahead 40%-38% -- essentially a statistical tie. But the Virginia Education Association, which endorsed Northam, released a May survey from Public Policy Polling that showed Northam up by 10 points. Internal polls understandably show contradictory signals. A mid-May Northam internal showed him ahead 50%-33%, and Northam internals reportedly still show him up by roughly 10 points 6. But a Perriello internal found 7 the former congressman up 37%-36%, similar to the Post poll. Of course, any internal or ally poll has to be taken with many grains of salt. Still, there's one thing that the public and private polls agree on: there are a lot of undecideds. Considering the varied poll results and the fact that polling a primary electorate is challenging because primaries are low-turnout events, the outcome is uncertain with less than a week to go. Unfortunately, it's possible that there won't be another public poll between now and June 13, about a month after the most recent survey of any type, so we may be in the dark going into Election Day. Based on the available polling, we can make some limited statements about the geographic and demographic bases of support for Northam and Perriello. Both candidates do well in their home territory -- Northam in Hampton Roads and the Tidewater, Perriello in central and some of western Virginia -- which would be expected given the “friends and neighbors” effect one sometimes sees in primaries. Younger voters are more supportive of Perriello while older voters are more likely to back Northam. This may be an advantage for Northam because the likeliest voters tend to be older. Moreover, out-of-state college students who may have registered in Virginia for the 2016 cycle may not be around on June 13 because of summer break. Given the sharp age disparity in support for Clinton and Sanders in the 2016 Democratic presidential primary and the age breakdowns in the 2017 Democratic primary polls, it should be unsurprising that Sanders voters are more supportive of Perriello while Clinton backers are more supportive of Northam. However, we should not overstate the alignment of voters based on the 2016 presidential primary candidates to Northam and Perriello. If the 2016 primary were absolutely indicative of the 2017 primary, Northam would be a shoo-in to win because Clinton beat Sanders by 29 points in the 2016 Virginia primary. But because Perriello is receiving the backing of more Sanders voters, perhaps the 2016 Clinton-Sanders race can at least tell us a little bit about the geographic strengths of the candidates, and provide an opportunity to discuss where they'll need to do well. Take a look at Map 1, which shows the precinct-level voting for the 2016 Democratic presidential primary. On the whole, Sanders generally did better the farther west one went, especially outside of the Urban Crescent -- the three major metropolitan areas of Greater Richmond, Hampton Roads, and Northern Virginia. This pattern seems likely to repeat itself to some extent in the gubernatorial primary, though that will also be due to Perriello's representation of VA-5 for two years and Northam's background in the Hampton Roads area in the eastern part of the state. Expect Perriello to perform notably better than Sanders in Southside Virginia (south-central), which makes up a large chunk of VA-5. The bad news for Perriello is that only about 18% of the 2016 primary vote came from areas outside of and west of the Richmond metropolitan region -- basically, the area of the state located west of the three big urban areas -- which may be the most lopsided part of the vote in Perriello's favor. Northam wants to mimic Clinton by carrying Hampton Roads by a large margin, which she won 70%-29% in 2016. In that respect, he also wants to mimic himself: In his 2013 primary victory for the Democratic lieutenant governor nomination, Northam won his home region 63%-37% while winning statewide 54%-46%. Overall, 20% of the 2016 primary vote came from the Hampton Roads region, not much more than from the central and western reaches of the state. But with candidates from each of those areas, it would be reasonable to expect them to make up slightly higher shares of the total vote than in the 2016 presidential contest. For instance, Hampton Roads made up 28% of the vote in the 2013 lieutenant governor primary that Northam won. The important unknowns in the race are, geographically, Northern Virginia and Richmond, and, demographically, African-American voters. The 2016 primary map above shows that Sanders actually did well in central Richmond, and Perriello may find some success there as well. But the primary polls, which don't necessarily have large subsamples for some geographic and demographic categories, conflict on who has more strength in the Greater Richmond area. Northam certainly has a presence in local news coverage as lieutenant governor. But perhaps the most important aspect of the primary will be the vote in Northern Virginia -- it made up 41% of the 2016 presidential primary vote -- and what surveys we have suggest it will be competitive. Of the three major metropolitan regions, it was actually Sanders' best one, though he still lost it 63%-37%. If either candidate wins Northern Virginia by more than a few points, that could be the ballgame. In that respect, Northam may have gotten a big break earlier this week when the Washington Post endorsed 8 him. The Post may be one of the few newspaper endorsements worth having, at least in a Democratic primary. For example, it played a part in the 2009 Democratic primary for Virginia governor, when state Sen. Creigh Deeds (D) moved into the lead 9 after the paper endorsed him and won going away. Still, that race had a different, three-candidate dynamic that may have made the endorsement more impactful. ;feature=youtu.be">radio ad that is running during the final days of the campaign. Still, Perriello represented the Piedmont and Southside Virginia, which have their fair share of African-American voters, and while Obama has not officially endorsed in this race, Perriello is highlighting Obama's support from 2010. While the gubernatorial contest has no African-American candidate, which could conceivably depress black turnout, Justin Fairfax (D) is running for lieutenant governor and is probably the favorite in that contest. His candidacy could lift turnout 11 among this critical demographic group and in the primary as a whole. This brings us to overall turnout. The last Democratic primary for governor had 319,168 voters, which was 6.3% of registered voters in the state of Virginia. But that contest had a fairly lopsided result -- Deeds won by 23 points in 2009 -- and occurred in a different sort of political climate from the one we are currently in. Still, there was also no concurrent Republican primary for governor in 2009, which meant a few Republicans could have voted in the Democratic primary due to the state's lack of party registration. The 2017 cycle is actually the first in Virginia history where both parties are holding concurrent, contested primaries for governor, which means there will be very little crossover voting on June 13 (technically both held primaries in 1949, but Republicans only had one candidate). Unlike 2009, the 2017 primary will be taking place in a period of Democratic animation in the Age of Trump. Moreover, the competitive head-to-head nature of the race will likely encourage more participation as close contests tend to have higher turnout. Table 1 below features some turnout scenarios. The high end of a half million voters seems like quite a lot, but the epic battle in the 1977 Democratic primary for governor between former Lt. Gov. Henry Howell and state Attorney General Andrew Miller saw 493,108 votes, so perhaps it's not out of the question. Moreover, the Virginia Public Access Project has been tabulating early absentee ballot requests 12, and finds that the 2017 Democratic rate of absentee activity isn't that far off from the 2016 presidential primary, which is remarkable. A reasonable turnout guess might be 400,000, but given the absentee requests, perhaps 500,000 could be in the realm of possibility. Considering what we said about the profile of likely voters earlier (i.e. older voters tend to be likelier voters), higher turnout might be good news for Perriello if it means that more individuals with lower-turnout profiles (such as students) cast ballots. For what it's worth, almost 500,000 voters showed up for New Jersey's uncompetitive Democratic primary for governor. The Garden State is bluer than the Old Dominion, but the two states are fairly similar in size by population and Virginia has a more competitive Democratic contest. In closing, it should be noted that Sen. Tim Kaine 13, McAuliffe 14, and other Democrats who back Northam have generally been respectful toward Perriello. This may be in part because they know he could win the nomination, and the party will want unity as it heads toward the general election. Nonetheless, Northam has outspent Perriello -- with a $3.7 million to $2 million edge in TV ad expenditures 15 -- and goes into the final days of the primary with a cash-on-hand advantage of $1.3 million compared to Perriello's $734,000. It looks like it's going to be a reasonably close contest, which raises questions about the extent to which the party will be divided in the wake of the primary results. A final key ingredient in the stew: Which Republican will probably face Northam or Perriello in the fall? Read on. Compared to the Democratic contest, there is less to say about the GOP gubernatorial primary simply because it doesn't seem to be as competitive. Whereas both Northam and Perriello have raised and spent millions while polling close to one another, the GOP field has a clear frontrunner: 2014 U.S. Senate nominee and former Republican National Committee chairman Ed Gillespie. Thus far, Gillespie's campaign has raised $4.9 million and spent $2.5 million, dwarfing the fundraising and outlays of his two primary opponents, Prince William County Board of Supervisors Chairman Corey Stewart and state Sen. Frank Wagner. Gillespie has raised about five times as much as Stewart and nearly eight times as much as Wagner. Along with his resource advantage, Gillespie has also led every single poll in the race, albeit with 38% as his highest percentage in any survey. Still, he led by 20 points in the most recent poll from the Washington Post, making it easy to peg him as the favorite for the GOP nomination. The frontrunner's near-upset of Sen. Mark Warner (D) in the 2014 Senate race despite being heavily outgunned put a feather in Gillespie's electoral cap, quickly prompting rumors about another statewide run in the near future. That near future became 2017, with Gillespie seeking to mimic Warner's approach by using a closer-than-expected Senate loss as a springboard for a gubernatorial bid (Warner lost a 1996 Senate bid to then-Sen. John Warner, a Republican, and then won the 2001 gubernatorial contest). Gillespie's principal Republican opponent was expected to be Rep. Rob Wittman (R, VA-1), but the congressman bowed out before the 2017 calendar year, solidifying Gillespie as the favorite. Gillespie has made a tax cut the centerpiece of his campaign, which has drawn intraparty criticism from Wagner. The state senator doesn't sound the usual Republican notes on taxes and spending, arguing 16 that the state's finances can't handle the proposed tax reduction. Wagner entered the race because the state party opted for a primary instead of a convention, ostensibly increasing his chances for the nomination. But Wagner has struggled to make inroads, partly because Gillespie had sewn up most establishment support before Wagner got in. It also can't help Wagner that he's shown a willingness to back tax increases, such as a higher gas tax, and can be cast as a career politician after 25 years in the General Assembly. However, Wagner received the surprise endorsement from the Washington Post a couple of days ago. That's the good news for him; the bad news is that the Post doesn't hold much sway over Republicans. Corey Stewart began the campaign trying to angle for the support of Trump voters, having at one time chaired the president's campaign in Virginia. However, that strategy failed to pay dividends on its own, prompting Stewart, a native of Minnesota, to make his name mainly as a defender of Confederate monuments in Virginia as communities throughout the capital of the Confederacy debate how to handle the sordid history surrounding these artifacts of the past. Based on the polls and fundraising numbers, Stewart's approach has not altered the playing field. Overall, Gillespie is aided by the fact that Stewart and Wagner are splitting up the potential anti-Gillespie portion of the electorate. This is only the fourth gubernatorial primary in the history of the Republican Party of Virginia. The first came in 1949, but in the end only one candidate filed and though there was a competitive lieutenant governor contest, turnout was abysmal due to the fact that many Republicans crossed over to assist the Byrd Organization's candidate in the Democratic gubernatorial primary. (The Crystal Ball highly recommends interested readers consult The Dynamic Dominion by Frank Atkinson for more on this episode.) This disastrous first primary scared off the GOP from holding another statewide primary for 40 years. In 1989, the GOP had a close three-way primary battle. In the end, former state Attorney General J. Marshall Coleman eked out a 37%-35% win over former Sen. Paul Trible, with both finishing slightly ahead of Rep. Stan Parris. The most recent Republican gubernatorial primary was a low-turnout affair in 2005, which saw state Attorney General Jerry Kilgore easily win the party nomination against a minor opponent. Outside of those three primaries, conventions have selected past Republican nominees -- in Virginia, the political parties mostly determine the nomination method 17 used in a given contest, which means a party might use a primary one cycle but a convention in the next. The 2017 GOP nomination was originally expected to be decided by a convention, but the state party opted for a primary 18 after much internal squabbling. 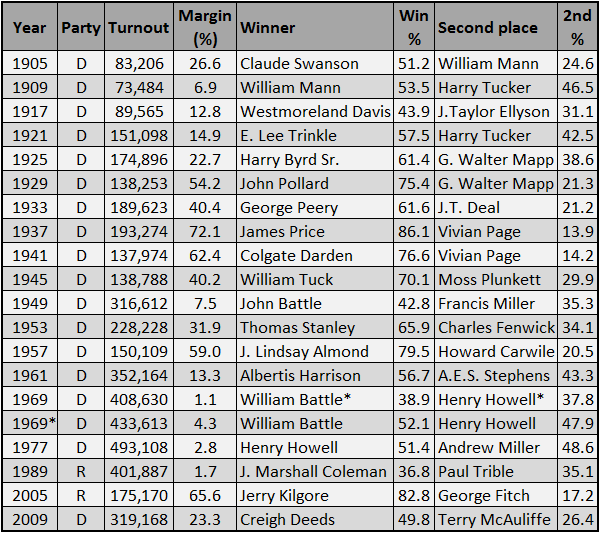 Table 2 below notes every contested gubernatorial primary in Virginia history. Notes: *After anti-Byrd Organization candidate Francis Miller almost won the Democratic nomination in 1949, the Organization forces pushed through legislation in 1952 to create a runoff law for instances where no candidate won a majority of the primary vote. This law was only used once in a gubernatorial primary, in 1969, before being dropped in 1970. Democrats held unopposed primaries in 1913, 1965, 2001, 2005, and 2013. Republicans held a primary in 1949 that had votes, but the party only had one candidate, Walter Johnson, who won 8,888 votes. In other cycles, the parties either picked their nominees at conventions or had no nominee. Margin figures may not match subtracting the second-place percentage from the winning percentage due to rounding. With this being the first time both parties are holding contested primaries for governor in the same cycle, overall primary turnout for gubernatorial contests in 2017 will probably break the record for an off-year Virginia statewide primary. The previous record for a state-level office primary was the aforementioned Democratic contest between Howell and Miller in 1977, which had nearly 500,000 votes. But it seems fairly likely that the combined Democratic and Republican gubernatorial contests will outdo a half-million votes, perhaps by quite a lot. Although turnout in the less-competitive 2017 GOP primary will probably be lower than in the Democratic contest, even the blow-out 2005 Republican primary had 175,170 voters. We should mention that both parties are also holding three-way battles for lieutenant governor. On the Democratic side, attorney Justin Fairfax is probably the favorite for the LG nod, having unexpectedly nearly beaten Herring in the 2013 attorney general primary and outraised his two opponents in the 2017 primary. But it's possible that veteran political operator Susan Platt, a former aide for then-Sen. Joe Biden (D-DE) and campaign manager for multiple statewide Democratic efforts, could surprise Fairfax. She's been endorsed by EMILY's List, which works to elect Democratic women to office, and she led the only public poll of the lieutenant governor's contest in March. Also running is Gene Rossi, a former prosecutor with the Department of Justice, who has raised roughly the same amount as Platt. Going into the home stretch, Fairfax has about twice as much money in his war chest as either opponent. The Republican contest for lieutenant governor has received far more attention than the Democratic race, albeit not for the reasons that the party would prefer. The candidates in the GOP race are state Sens. Bryce Reeves and Jill Holtzman Vogel, as well as state Del. Glenn Davis. Reeves is a veteran and former narcotics detective who was first elected to the Virginia Senate in a super-close contest in 2011. A partner at her law firm, Vogel specializes in campaign finance and was once chief counsel for the Republican National Committee, and she was elected to the Virginia Senate in 2007. Lastly, Davis is a small businessman and won his seat in the House of Delegates in 2013. The state senators are viewed more-or-less as co-favorites, but controversy 20 between the two has dominated the headlines in the race. It all started with an email that was sent to some of Reeves' supporters, which claimed that Reeves had an affair with an aide. It turned out, however, that the IP address of the email belonged to Vogel's home address and her husband's cell phone. Reeves filed a defamation lawsuit and is seeking to depose Vogel and her husband. Now the Vogels are trying to quash the subpoena request, with a court hearing on the matter scheduled for June 9, just four days before the primary. The question is, does this soap opera open a door for the underdog Davis to squeak through? The phenomenon of two candidates slamming each other so much that a third candidate shoots the gap to win has happened a number of times in other races in Virginia and elsewhere (for instance, it may have helped Deeds in the 2009 Democratic gubernatorial primary). Davis has gained some notoriety for campaigning in an RV as he travels the state. But Vogel has spent $1.6 million on the race and Reeves almost $800,000 compared to Davis' less than $500,000. So this race is very much in the air and provides more potential drama on Election Night. While neither party has a primary for attorney general -- the incumbent, Herring, is unopposed for renomination and will face John Adams (R), who also has no intraparty opposition, in the general election -- there are 26 regular primaries for nominations to the House of Delegates in 23 districts, along with various primaries for local offices. June 13 is going to be a busy day in Virginia politics, and it's going to set up an even more interesting November. As noted above, we now have nominees in 2017's other gubernatorial race, in New Jersey. Phil Murphy (D), a wealthy Goldman Sachs alum and former ambassador to Germany, and Lt. Gov. Kim Guadagno (R) both easily won their primaries on Tuesday and will face off in the fall. Murphy has seemed like a big favorite all along: Scattered pre-primary head-to-head polling has shown Murphy near 50% already and up by healthy, double-digit margins over Guadagno. This race may largely be about outgoing Gov. Chris Christie (R), who is immensely unpopular, and President Trump, who also is unpopular, two factors that work in favor of the Democrat. We wouldn't completely rule out the possibility of an upset and we're keeping the general election rated as Likely Democratic to start, but we can imagine it shifting to Safe Democratic before too long. Of the two gubernatorial races this fall, Virginia seems likelier to be highly competitive than New Jersey.